Porter Airlines will be flying to Muskoka Airport with the introduction of 2019 summer service. Flights will have an air time of approximately 20 minutes, operating twice weekly between YTZ and YQA from 27JUN to 3SEP. Flights will depart from Toronto and Muskoka on Monday mornings and Thursday afternoons. Connecting flights are available via Toronto for numerous Porter destinations in the U.S. and Canada. "Muskoka is an inspiring destination that attracts travellers from near and far," said Robert Deluce, president and CEO of Porter Airlines. "This new route serves as a great opportunity to link Muskoka to our North American network." 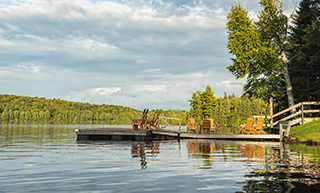 Popular with outdoor enthusiasts, Muskoka – home of Algonquin Provincial Park and Georgian Bay -- has established itself among the world's iconic summer retreats. The cottage country offers a charming variety of amenities with golf courses, marinas, camps and cultural attractions spanning the region. "As the regional tourism organization for Muskoka, Parry Sound and Algonquin Park, it is our intent to leverage this service to increase international visitation across our entire region,” said James Murphy, executive director of Explorers' Edge, one of thirteen regional tourism organizations funded by the Ontario Ministry of Tourism, Culture and Sport with a mandate to build the regional tourism industry in parts of Central Ontario. Explorers' Edge will introduce a seasonal shuttle bus service at the airport to deliver Porter passengers to accommodations across the region. The organization will also offer $100 spending vouchers as an incentive for tourists who book a flight and accommodation. Flights are currently available for booking on Porter's website and through travel agents. For complete schedule and booking details, visit www.flyporter.com.